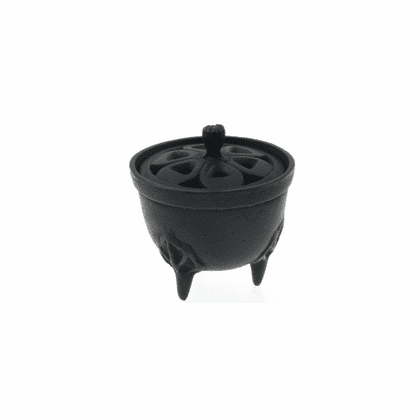 Black cast iron with slotted lid incense burner. For cones, sticks (with sand that is not included) or charcoal burning. 3-1/2 inches tall, 3-1/4 inches in diameter. Currently we offer one package of Morning Star incense 50 sticks which you can choose from Sandalwood incense #E4181, Myrrh incense #E4835, or Frankincense incense #E4834 ($3.95 value) when you order the black cast iron incense burner, #520023.